Plans for a £3.2m upgrade of spectator facilities at Wetherby Racecourse have been unveiled. Construction work is due to take place next summer, subject to planning permission being granted by Leeds Council, which will see the 55-year-old Members’ Stand replaced with a state-of-the-art building. Officials at the West Yorkshire track are hopeful that the new complex will make the racecourse more attractive to racehorse owners and trainers alike. Due to be built adjacent to the Millennium Stand, which was opened on Boxing Day, 1999, the announcement comes ahead of tomorrow’s curtain-raiser to the 2015-16 National Hunt season. Jonjo Sanderson, Wetherby’s chief executive and clerk of the course, said the redevelopment project will “complement the other areas of extensive modernisation that have taken place at the racecourse during the recent past”. He added: “It will create one of Yorkshire’s premier and more attractive sporting, leisure and business facilities. “One of the primary drivers is the owners’ and trainers’ experience at Wetherby, and which needs to move up a gear. Although the ground floor will include a new bar, betting shop and spectator terrace, the centrepiece is likely to be the first-floor which will offer panoramic views of both the paddock and the racecourse. For the exclusive use of owners and trainers on racedays, it will offer an enhanced refreshment area and a stewards’ room. On non-racedays, it will be utilised as either a conference or wedding venue. The second floor will consist of either an exclusive hospitality facility for larger private parties or a premium facility for Premier Enclosure racegoers while the top tier will feature the commentary box, photo-finish facility, the side-on television/video camera positions and the racecourse commentator. Meanwhile 2012 Champion Hurdle winner Rock On Ruby is being geared up to make his seasonal return in the bet365 West Yorkshire Hurdle at Wetherby on October 31 – Charlie Hall Chase day. Trainer Harry Fry’s stable star was last seen finishing second behind Jezki in the Aintree Hurdle in April, having missed the Ladbrokes World Hurdle at Cheltenham following a dirty scope. 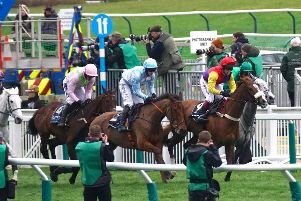 Fry said: “Rock On Ruby will run in the Grade Two hurdle at Wetherby on October 31. Tom Marquand and Jack Garritty both drew a blank at Windsor yesterday in their battle to be the 2015 champion apprentice. Marquand, attached to Richard Hannon’s yard, remains two ahead of the Malton-born teenager with just five days to go. Although Yorkshire horse of the year The Grey Gatsby is to miss the prestigious Breeders’ Cup meeting in America, Hambleton trainer Kevin Ryan has confirmed that the Royal Ascot will remain in training next season as a five-year-old.